Buddha Unfolding Festival is celebrated in Tashilhunpo Monastery from the fourteenth to the sixteenth day of the fifth month in Tibetan calendar. 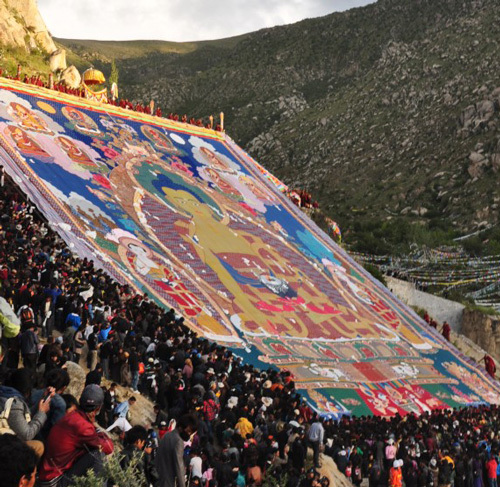 During the three days, people are able to see the unbelievable huge Thangkas of Amitayus, Sakyamuni and Maitreya displayed on the monastery’s Thangka Walls and they will unveil the giant thangka day by day. The tradition has lasted for about 500 years and it is an important festival for the monastery. Moreover, Every year thousands of pilgrims come to the monastery and give their offerings to the Buddha for the accumulation of their merits. At that moment, even if you are not a pure pilgrim, you will be stunned by the sacred scene.